Our team here at Zembula is crazy about interactive content marketing. Why? Well, interactive campaigns are proven to convert up to 6X more than static campaigns and they’re inherently more entertaining. An engaging interactive campaign cannot only boost conversions, but it can also help you grow brand loyalty as well. Let’s take a look at 10 of our favorite interactive campaigns to examine why they’re so successful and how you can implement the same strategies in your next campaign. Regardless of your political opinions, every marketer can appreciate a good campaign when they see one. Hillary’s 2016 presidential campaign may not have been successful, but this microsite was a brilliant stroke of marketing genius. The website presented skeptics with a series of her biggest accomplishments, backed by reliable sources. It also allowed the user to dive in and get more details with a series of interactive options with buttons like “This doesn’t affect me personally, so who cares?” The website was incredibly effective at presenting a high volume of facts quickly in an entertaining way. Sometimes, interactive campaigns are the best for conveying a bunch of complex information quickly. That’s exactly what this calculator from the Henry J. Kaiser Family Foundation does. By visually conveying information and allowing input from the user, this calculator helps simplify the highly complex issue of finding health insurance and understanding how much it will cost you. Interactive charts or infographics are another unbeatable way to convey massive amounts of complicated and data-driven information quickly without confusing your user. The Guardian demonstrates an effective use of this strategy with their interactive chart that shows how temperatures have increased over the user’s lifetime and gives scientific predictions based on climate change for the future. This interactive article from National Geographic also conveys data related to climate change, but it shows that you don’t have to craft a super complex campaign in order to convey information in an interactive and engaging way. With nothing more than a set of dramatic sliding images, the magazine is able to create an emotional impact on the reader by asking them to consider the implications of climate change. Taking the opposite of National Geographic’s streamlined approach, Quanta Magazine has released an interactive campaign that covers the entirety of physics theory in a sprawling and clickable map. While the information containing with this campaign is in-depth, the interactive approach makes the foreboding topic more approachable for a casual audience. In today’s digital era, most interactive campaigns are hosted on the internet, but this throwback ad from Pepsodent proves that newer technologies aren’t the key to interactive marketing success. 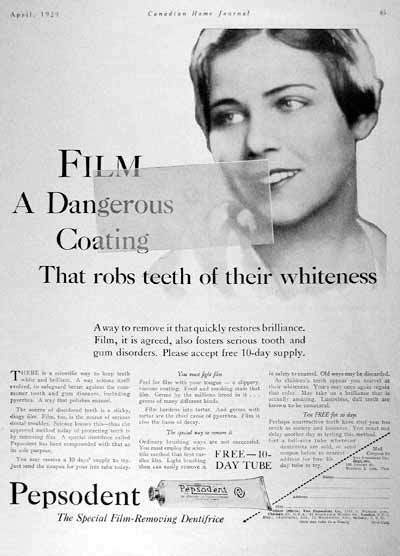 This print ad encouraged readers to “Just run your tongue across your teeth.” It then explained that “You’ll feel a film- that’s what makes your teeth look ‘off-color’ and invites decay.” By tying their static campaign to an interactive motion they converted millions of users and got America to start brushing their teeth. Not only are interactive campaigns great at getting across large amounts of information, but they can also help your customer distill that information down and make important decisions. That’s the goal of this Warby Parker quiz that asks users questions about their personality and sense of style in order to help narrow down their choices and find the perfect vision glasses. This interactive map uses a familiar format, switches, to give the user control over the way information is displayed. By using interactive technology to enable readers to view how much of the world’s electricity is still reliant on the three traditional energy sources – coal, oil, and gas, this map boils huge amounts of data down into a form that even the most casual reader can understand. Another example of a detail-oriented microsite comes from Lucidwork’s Dark Data campaign. The site is packed with easily understandable interactive infographics that alert the user to dark data’s dangerous potential. The site is so effective because it combines a data-driven message with excellent storytelling that draws the reader in from the moment they hit the microsite. Now that we’ve talked about 10 favorite examples of interactive content marketing, hopefully you’re feeling inspired to start your next interactive campaign today!